Cholera Makes History In Yemen, Strikes Mozambique In Wake Of Cyclone Idai : Goats and Soda In theory no one should die of cholera. Yet 90,000 people die each year from the disease, which is surging at a historic pace in Yemen and surfacing in Mozambique in the wake of Cyclone Idai. 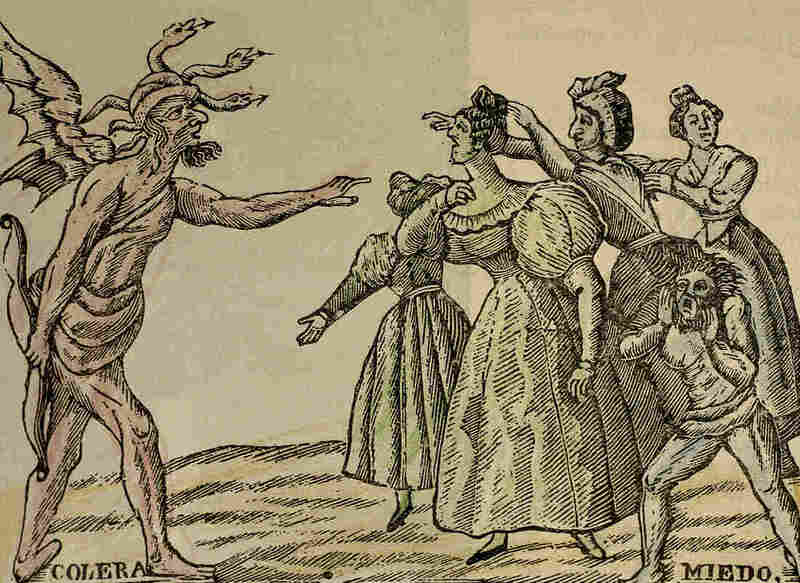 The figure at left is the personification of cholera, facing resistance from a group of women. This 19th century engraving is from Barcelona. Editor's note: This story was republished on April 5 to include new information on Mozambique's cholera outbreak. "We have been confronted with a sharp increase since the beginning of this year," said Brienne Prusak of Doctors Without Borders (MSF). In that time, they've seen an increase from 140 to 2,000 cases per week to reach about 1.4 million cases since the outbreak began. Since January, the death toll has been 190. Meanwhile, in the aftermath of Cyclone Idai, cases are surfacing in Mozambique and other affected countries. This week, the first death from cholera in Mozambique was reported in the city of Beira. It's a reminder that an ancient disease – and one which is easily treatable — can still take a terrible toll in modern times. It's a severe gastrointestinal disease, transmitted by a bacterium called Vibrio cholerae. And it can trigger so much diarrhea and vomiting that patients can rapidly become dehydrated. They can lose so much fluid that their internal organs shut down. As we reported in 2016, the water-borne disease has been around for centuries, and it remains a global health risk. According to the World Health Organization there are roughly 3 million cases a year and 90,000 deaths. Cases crop up throughout the world — particularly when crisis strikes and clean drinking water is not available, as in Yemen. Cholera often spreads through water that has been contaminated by bacteria; it often enters the water from the diarrhea of someone who is infected. On March 14, Cyclone Idai wrought devastation across Mozambique, Zimbabwe and Malawi, with more than 815 reported deaths. In the wake of the disaster, which was the worst to hit southern Africa in two decades according to UNICEF, 3 million people need humanitarian assistance, half of them are children. In addition to injuring thousands, the cyclone also damaged infrastructure and flooded sources of drinking water, especially in the hardest-hit port city of Beira, Mozambique. "The cyclone substantially damaged the city's water supply system, resulting in many people having no access to clean drinking water," Gert Verdonck, MSF's emergency coordinator in Beira, said in a statement. "This means that they have no option but to drink from contaminated wells. Some people are even resorting to drinking stagnant water by the side of the road." Public health officials were concerned about the possible spread of cholera in Mozambique--and last week, five cases were confirmed. By Monday, that number had jumped to 1,000 suspected cases. "There are seven emergency cholera treatment centers operational in Beira and two more being set up. Two additional centers are being set up in Nhamatanda," David Wightwick, the World Health Organization's team leader in Beira, told the Associated Press. WHO will begin administering 900,000 doses of the oral cholera vaccine on Wednesday. The disease recently struck other countries in Africa as well. Last year, there were 10,000 cholera cases in northern Nigeria — a record for that region — with 175 known deaths. Public health specialists fear that Nigeria is headed toward another outbreak following a recent spate of violence that has led to overcrowding at displacement camps. Last year, there were also outbreaks in Zimbabwe, Niger, Cameroon, Somalia, Democratic Republic of Congo, Mozambique and Tanzania, according to WHO. Even though cholera is making headlines in 2019, it's hardly a new disease. "It's been in the Ganges delta from time immemorial," says Dr. David Sack, a professor at the Bloomberg School of Public Health at Johns Hopkins in Baltimore. Cholera began spreading from India throughout the West in the early 1800s with more global trade and travel by ships, he explained, with cases cropping up from Russia and Western Europe to Baltimore, New York and Philadelphia. "It was a disease that affected large parts of the world," he says. And it killed millions of people as it spread across the globe. Left untreated, cholera has a fatality rate of about 50 percent. "At that time, we didn't know what caused it," says Sack, who's spent much of his career studying the disease. "We didn't know how to treat it." Theories about the cause of the illness were plentiful. The leading suspect was the foul air rising from sewers and piles of rotting trash in cities; poison from the soil was another possible culprit. Others looked higher up for a cause: Some church leaders said it was retribution by God for sinful behavior. Nearly all of the theories had a common thread, though. There appeared to be a link between cholera and overcrowded urban areas. Finally, in the 1850s, an English doctor named John Snow became a legend of public health for figuring out that an outbreak in the Soho neighborhood of London was linked to a single drinking water source. Dr. Snow is credited with stopping the raging outbreak, which claimed 10,000 lives across London, by taking the handle off of the Broad Street water pump. Snow argued correctly that water contaminated with sewage was spreading the illness from one resident to another. But he still didn't know exactly what the water was contaminated with; at the time, the pathogen that caused cholera hadn't yet been discovered. He theorized that it might be tiny parasites or germs or some "poison" able to reproduce in the water. Around the same time an Italian scientist, Filippo Pacini, identified the bacteria that causes cholera. But his discovery wouldn't be widely accepted for decades — and in the meantime, millions more died. Cholera now is a treatable disease — as long as the patient gets medical attention quickly. Treatment consists of simply keeping the person hydrated. If they are capable of drinking, they can be treated with oral rehydration fluids — basically souped-up sugar water. This strategy works in about 80 percent of cholera cases. In more severe cases, the patient may need to be given fluids intravenously alongside antibiotics. There are also three vaccines that can be administered in areas where cholera is endemic or when an epidemic begins to spread. More than 30 million people have been immunized since the oral vaccines were developed in the late 1980s. WHO's Global Task Force for Cholera Control announced a plan in October 2017 to end cholera by reducing cholera deaths by 90 percent and eliminating the disease in as many as 20 countries by 2030. A major challenge, however, is access to safe water and good sanitation — both key to preventing outbreaks. Otherwise, cholera persists even after an epidemic begins to slow. One of the biggest outbreaks in history took place in Haiti, where cholera was introduced by U.N. Peacekeepers in the wake of the 2010 earthquake. It spread quickly; since 2010, there have been 819,000 cases and nearly 10,000 deaths from the disease. In 2018, Haiti saw fewer than 4,000 suspected cases and 41 deaths — a massive improvement even from the year before. But there is always the chance of resurgence — especially as public health resources shift to the growing 2019 outbreaks. "This significant progress so far is to be considered with great caution," the U.N. Office for the Coordination of Humanitarian Affairs said in a January 2019 report on the Haiti outbreak. "As long as cholera is circulating on the Haitian territory, an upsurge and expansion of the epidemic is possible." What Doctors Without Borders is calling the largest mass cholera vaccination campaign ever began on April 5 in the city of Beira, Mozambique. Dr. Ilesh Jani, the director general of Mozambique's National Institute of Health, is coordinating efforts to distribute nearly 900,000 doses of the orally administered vaccine to at-risk areas around Beira. In an interview with NPR's Audie Cornish on Friday, Jani said, "In a way, the cholera vaccine has been designed for this kind of emergency situation." The oral vaccine has been shown to be 86 percent effective in two doses but public health groups say it appears to be effective with one dose as well. Jani is confident that it can help contain the outbreak in Mozambique. Health officials are distributing the vaccine at specific locations like hospitals and temporary housing tents as well as through mobile teams that travel to schools and markets, sometimes arriving by helicopter. Jani says the teams are already a quarter of the way to meeting their goal of 870,000 vaccinations.